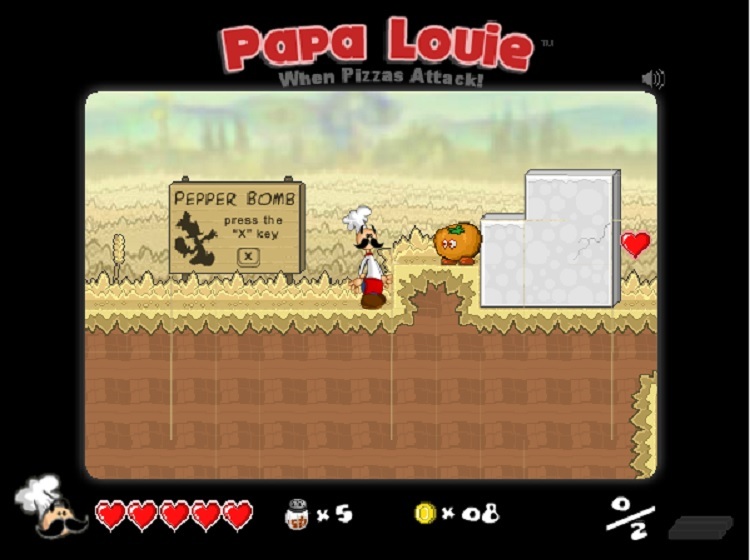 Papa Louie is an interesting and addictive game that is based on the food theme. The game begins when Papa Louie needs to find the pizza monsters. Papa Louie is a proud owner of Papa’s pizza shop. He is giving away free pizzas to each of his tenants but somehow his yummy pizza turns into mutant monster pizzas. These monsters are trapping the tenants of Papa Louie’s building in the multigrain fields. Will Papa Louie be able to save all his tenants that have been taken hostage? Let’s find out! Controlling the game is a bit tricky, but once you get the knack of it you will be able to play quickly. You need to use the arrow keys for movement. The Space bar has to be used for making Papa Louie Jump. If you want to glide then press and hold the Space bar. However, ensure that you do this only when you are in the air. The ‘Z’ key has to be used for hitting the enemies. To balance and hold a heavy thing, use the ‘Z’ key plus the left or right arrow keys. This can be done only while walking. The ‘X’ key is for throwing pepper bombs. For carrying the pizza, you need to press the down key over the pizza box. If you are cheesed, then tap the Space bar repeatedly. The pulley system will work when you make use of the pizza, as it will weigh the platform down. You can collect lots of coins, lives, and money as you keep progressing in the game. These coins are scattered everywhere, so ensure that you explore the entire stage and collect as many coins as you can. With the help of these coins you will be able to purchase several things from the game shop. Pepper Bomb: As the name suggests, it acts as a grenade that can kill the enemy instantly. Pizza Bat: This is the bat that Papa Louie usually uses for making pizzas. However, now he will use it to smash the mutant monsters. Chef Hat: It is Papa Louie’s favorite chef hat, which he wears everyday while cooking and serving his yummy pizzas. However, it is not an ordinary hat and can be used by Papa Louie to glide through long distances. Submarine Sandwich: They are extremely powerful and by hitting them once you won’t be able to kill them. So, an important tip here is that hit them thrice before moving forward, so that they are killed. Mutant Pizza: They can spit sticky cheese from their mouth and make Papa Louie glued for some time. So, try to stay away from them as much as possible. Papa Louie needs your help! 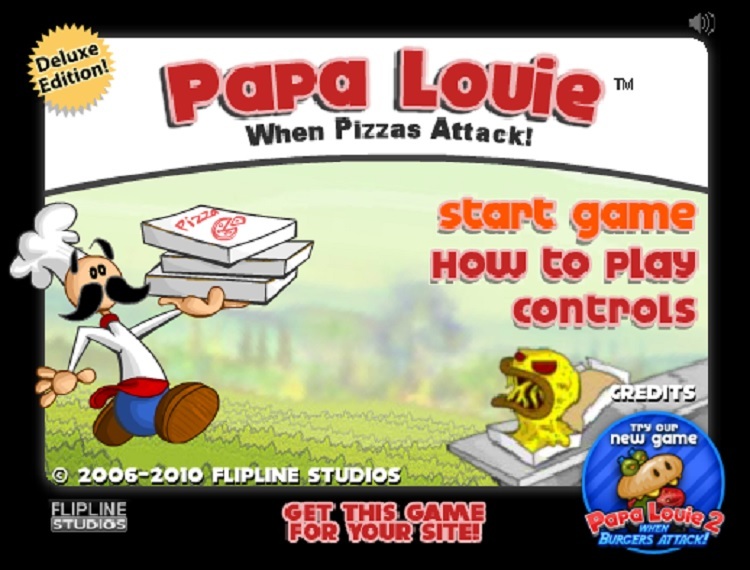 Get ready for some entertaining time while playing the Papa Louie 1 online game and try to save his tenants from the mutant monsters.